Scala, Inc has announced it is driving a large-scale digital signage network, running over 500 screens across 20 medical facilities, on behalf of Region Hovedstaden, the regional authority of Copenhagen, Denmark. The Scala network, named Info-TV, centralizes relevant national, regional, facility and department-level healthcare information on-screen to provide information to people located in the waiting rooms of the facilities run by the authority. 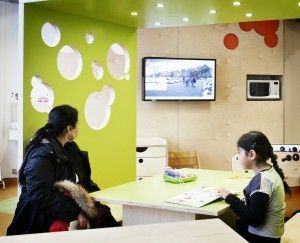 Deployed by local Scala system integrator ATEA following a public tender for centralized digital signage and support, Info-TV is part of a project by Region Hovedstaden to improve overall patient satisfaction during their interactions with the public healthcare system. The deployment at Region Hovedstaden includes 520 Scala players, driving a similar number of 42” and 55” screens split into a dynamic frame and a scroll feed. Scala was chosen because it was a proven digital signage technology platform that could handle the complexity of the project and provide easy management of the content on each screen coming from different ‘broadcasters’: the region, the hospital and the clinical department.